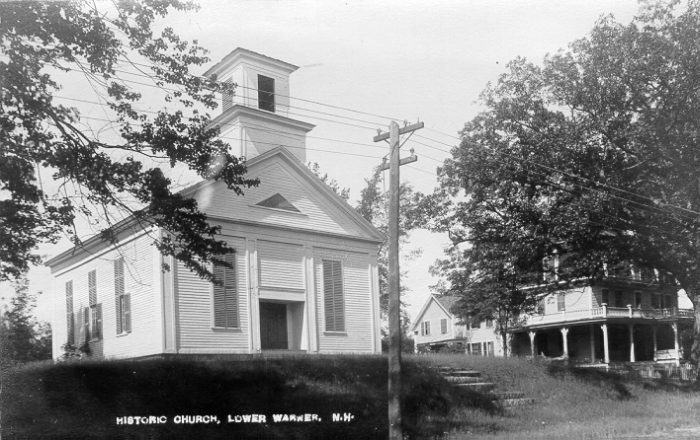 According to the two Warner history books – the one book by Walter Harriman and the other prepared by the Warner Historical Society, the first church and meeting house was built on Parade Road in 1766 with Reverend William Kelly as the Orthodox Congregationalist clergyman. That church burned down and a new one was erected on the same spot in 1770. In 1789 after much dissension among church members, a new place of worship was built under the ledge on the other side of the river in Lower Warner. Later in 1819 this church and meeting house was abandoned and a new one built a little to the west of the previous one. Then in 1844 once again plans were made to move the church, and according to papers and deeds just recently found in the attic at Nancy Sibley Wilkins house, dissention erupted for the second time. This move was violently opposed by about 28 families living in the Lower Warner area. They were so strongly opposed to this project, that they broke away from the Congregational Church and formed what was known as the Second Orthodox Congregational Society in Warner. Twenty-eight people signed an agreement dated June 10, 1844 to that effect and agreed to pay certain monies as shares or provide labor to erect their own meeting house. Evidently they were so angry at having the old meeting house moved around so much, that in this aforesaid agreement they state, "when built, said house shall be considered permanently located never to be removed either by vote of the share proprietors, the pewholders or the Society." It also states that the meeting house shall be located between the houses of Jacob Currier and Obediah Hutchinson. This group immediately set about buying property upon which to build, and there is a deed dated October 16, 1844 showing this land was bought for $900.00 from Stephen George for just such a purpose (said land being the same as that upon which the Meeting House in Lower Warner now stands). Both the agreement and deed were legally signed and witnessed, but were never recorded in Concord. The documents were kept in Joshua George’s possession and over the years were all but lost and forgotten until unearthed this year in the attic of the house Joshua George used to live in. Thus with no actual facts to go on, the Warner history books had assumed that perhaps the Methodists had something to do with the building of the Lower Warner Meeting House. However, this was not the case, and there is no doubt whatever, with the papers we now have on hand, that the building was in fact built in 1844 by a splinter group of the then existent Congregational Church. Calling themselves the Second Orthodox Congregational Society in Warner, these 28 families were: Joshua Sawyer, Stephen George, Abner B. Kelly, Eras. Wilkins, Daniel B. George, Stephen Bartlett, Thos. Bartlett, Jonathan Badger, Matthias Heath, James Allison, Joshua George, Harry George, Frederick Eaton, Benj. Currier, Jere Gove, James George, L. Bartlett, Stephen Badger, "Mr. Somebody", H.B. Chase, David Harvey, Betsey Lowd, D. Hutchinson, George Watson, Abner Woodman, Abigail George, Zebulon Davis, and Charles George. From what we’ve been able to find out, this splinter group could not have lasted very long as most of its family members seem to have been absorbed back into the original Congregational Church, said church having gone ahead with its controversial plan and moved its building down to the center of town where it still stands to this day, and where services are held every Sunday. Meanwhile, the Meeting House in Lower Warner, used only for a year or two at the most, remains virtually the same as when built 140 years ago. The George family members seem to have been the steering committee for building this new meeting house, as Stephen George provided the land, Joshua George headed up the small group who signed the deed, and the building was built squarely between Stephen’s house and Joshua’s house. Although abandoned almost at once as an official church, nevertheless the Joshua George family, true to the signed agreement, saw to it down through the generations, that the building was properly maintained and never moved from its original spot. Nancy Sibley Wilkins, a decendant of Joshua George, subsequently deeded the Meeting House to the Warner Historical Society who is carrying out the tradition of keeping it in good repair for the occasional wedding that takes place there and for the beautiful Christmas Service that is held by the Historical Society within its walls each December.